The National Council for Peace and Order (NCPO) has launched an investigation into allegations of motorcycle taxis being made to pay off influential people in Nonthaburi. NCPO Spokesperson Col Winthai Suwaree said that a unit under the NCPO has joined hands with local agencies in Nonthaburi to look into reports that motorcycle taxi services in the province have been paying kickbacks to those with influence, affirming that if such a practice is uncovered legal proceedings will take place. The spokesman assured that the NCPO has been serious about eradicating influential individuals and their oppression of motorcycle taxi service providers but noted such criminal elements have been adapting their approaches to avoid detection. He stated that information from the public would help authorities remedy the situation. 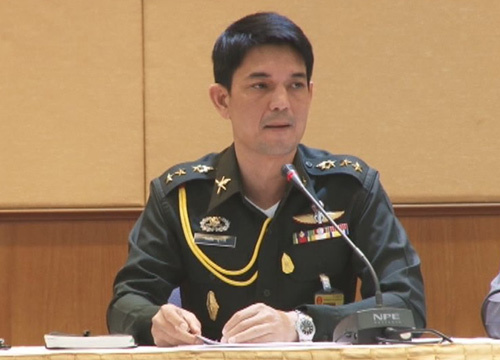 Col Winthai more generally assured that the NCPO is still working to bring order and regulation to society and that the Army Commander has been personally tasked with addressing such issues. He urged public cooperation to achieve success.